The ICT team at Air New Zealand is operating in uncharted territory and for CIO Julia Raue, this is the mark of success. Julia Raue encourages her team to work across various areas of the business, to “look behind the scenes” and see what happens at airports. This way, they stay in touch with the customers and the people they support in the different areas of the business. “It is important they understand what they are trying to change or what they are trying to enhance,” says Raue. 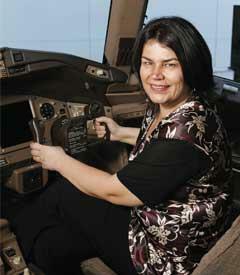 Today, she is proud that ICT is involved in areas of the airline that it has not been into before. Today, she says, they do “much more” including the new system that checks people entering the Air New Zealand lounge are actually flying with the airline. Previously, she says, staff had to check boarding passes as people moved across different areas like the lounge or the gate. Today, she says, ICT support people are assigned to domestic airports because of the new technologies that are in use at the local terminals. Working with the other sectors of the business, the ICT team has introduced award winning projects like grabaseat, where international deals sell out in minutes, and is now one of the most bookmarked home pages across New Zealand. Grabaseat was built — in secrecy and by a purely internal ICT team — in six weeks. She says it was a promotional tool the airline was prepared to lose money on, and never expected it to be the huge success it is today. “The lesson there is we tried something unique — we were prepared to walk away from it,” she say. The team then worked on transforming the domestic travel experience. Raue says the airline listened to customers who said they did not want to stand in queues. ICT harnessed RFID technology to cut down queues as customers without baggage can go straight to the gate, or customers can self-tag their bags. Central to the new self-service proposition was the deployment of self-service kiosks that are connected to various systems including reservation, departure and baggage. The connections were all enabled through newly developed web services, with the kiosk flow and web service code developed and tested in-house, says Raue. Interestingly, says Raue, the ICT team looks at other industries outside airline and travel, to find out how they tackle business challenges through technology. “We look at banks, hotels, areas like casinos, hotels, universities, department stores, banks, all [industries] collecting money and moving people around. She says this has allowed ICT to reduce cost while staying ahead of the business needs, maintaining higher levels of performance, capacity and availability and delivering innovative system. Raue says two things are key to her group’s success. First is, the management team believes in technology and what it can deliver. Second, is having a team that can prove time and time again they can deliver and provide good value too. “So when you have stakeholder trust on what technology can deliver and the team can deliver the benefits to the stakeholders, then you have almost got a happy marriage,” says Raue, who was named CIO of the Year at the 2009 CIO Summit. Raue joined Air New Zealand 11 years ago with a background of ICT responsibilities at organisations like the Auckland City Council and Vodafone, and at the then Air New Zealand-owned Ansett in Melbourne. She became CIO two-and-a-half years ago and has been generous with helping industry colleagues through mentoring — even those outside the airline industry, and supporting events such as forums for women in technology. Know your role. Learn, learn, learn your role, understand the key triggers, the key systems, the key stakeholders, she advises. “If it is a delivery portfolio, I understood firstly the initiatives I am to deliver, the problems they set to solve, the business they will support, what the deliverables are, the milestones and the financials,” she says. For a production or support role, understand what are the key systems and the core requirements. Build strong relationships. This applies to both your team members and stakeholders. Raue advises adopting a management style that suits our personality and style. Identify mentors. They could be because of their business knowledge, their negotiation style, their ability to build and maintain relationship, or build great teams. “Watch and learn from them.” Raue suggests thinking about who is the best in the field for an area and understand what drives them, how they are successful and what you can learn from them. Build a strong team. She says if you know there are skills you are not strong in, make sure that someone in your team has them. Be there for the business. “The best way to understand your business is to spend time in your business,” says Raue. “Sit on the help desk, spend time with the call centre agents and in operations.” At Air New Zealand, chief executive Rob Fyfe and members of the executive team work in various areas, including baggage handling, cargo and flight crew duties. Get regular feedback. It is important for people to know whether they are or are not on track. At the same time, she says, it is important to ask people for feedback. “Don’t guess,” she says. Applying this to a wider context, Raue welcomes feedback from the public on the ICT enabled projects at Air New Zealand. She is unperturbed about negative feedback posted on social networking sites, because this provides an opportunity for change or at least to consider the points raised by the customer. Take care of your team. Provide training, development and growth opportunities. Once they have these, she says, arm them with the tools they need to get the next job done.